NEW and never used large 6-Cup Teapot. No chips or cracks. See all the photos for proof of condition. Measures 18cms 7ins tall UK postage only. Use global shipping programme for international postage through ebay. Will be proof of postage and GPO tracked. Postage includes postage and packaging. Free local collection available. This listing is for a Royal Doulton, fine china, Juno floral design milk/cream jug and sugar bowl. The sugar bowl measures 11.3cm in diameter x5.3cm depth - White fine china with Juno floral design applied to top edge - angular to exterior - the milk/cream jug measures 11.3cm in height x 8.8cm base diameter (12.5cm handle to pourer) - white fine china with Juno floral design applied around middle - angular shaping to base section - both are marked on their base, 'Royal Doulton, Juno, 1988 Royal Doulton. Fine China, Dishwasher safe, microwave safe, chip resistant, freezer safe, oven safe' - in lovely condition - please see photographs! I will dispatch these items via courier (MyHermes) to allow for plenty for packaging! Please see my other items - i will combine postage! Royal Doulton Junoserving dish in excellent condition. I don't think that I have ever used this at all. 20-piece tea set, Royal Doulton “JUNO” excellent/first condition. 1 open sugar bowl. There are no obvious signs of usage. ROYAL DOULTON TEA SET. JUG 12cm high 14cm spout to handle. 4 x SAUCERS 15cm. TEA POT 18cm high, 23cm handle to spout. 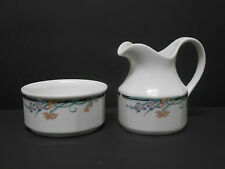 Royal Doulton Juno Large Creamer - New ! Floral on blue & green band. May show signs of light wear. Lovely Juno Milk Jug. In nice condition. Jug measures approx 12cm. [I endeavour;. 2] Answer any enquires quickly. The pattern consists of mauve/blue Iris flowers and pink carnations with sage green foliage around a black banding against a white porcelain ground. for overseas we can combine up to 2kg (maximum weight per parcel). Exquisite Royal Doulton 'Juno' Pattern Fine China Tea Service for two - as new! Royal Doulton 'Juno' Fine China Tea Service for Two. Two small side plates. Two saucers. THIS CHINA IS DISHWASHER - MICROWAVE - FREEZER & OVEN SAFE & IS ALSO CHIP RESISTANT. Royal Doulton Juno 2.5 pint teapot, milk jug and sugar bowl in excellent condition. 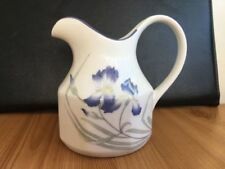 Royal Doulton Juno Milk Jug. In excellent condition. A pair of Royal Doulton Juno sugar bowl and milk jug. 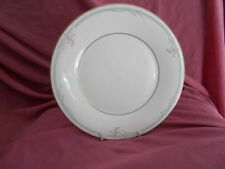 Marked to base Royal Doulton Juno fine china. Royal Doulton Juno Tea Pot, Milk Jug & Sugar Bowl. 1988. Floral on blue & green band. A sugar bowl and a milk jug. 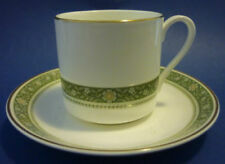 Royal Doulton cup and saucer, in the Juno pattern. Although previously owned this cup and saucer is in good condition. First quality, dates to c1988. 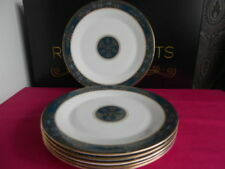 Royal Doulton Juno Cups & Saucers - New ! In Unused Perfect Condition. Quality China At The Right Price. Royal Doulton Juno Oval Open Serving Dish. Price Is Per Dish. British China At It's Best. Quality China At The Right Price. Although previously owned, this jug is in good condition, and is of first quality. Date to c1988. Royal Doulton Juno. Milk Jug & Sugar Bowl. ROYAL DOULTON. The Milk Jug is approx. 4.5" (11.5cm) Tall x 5" (13cm) from spout to handle. The Sugar Bowl is approx. 2" (5.5cm) x 4.5" (11.5cm) Dia. Made in England in the 1980s. JUNO PATTERN. ROYAL DOULTON. TEA POT - SIX CUP SIZE. FINE CHINA. and if you are searching for any specific item, such as, just a Saucer, Lid, Base, we may be able to help you. ORIGINAL MADE IN ENGLAND (NOW DISCONTINUED). 1 x Souffle Dish – 6 ½” 2½ pints. 1 x Souffle Dish – 5 ½” 1½ pints. 1 x Souffle Dish – 3 ½” 1/4 pint. 1 x 4 pt Pint Covered Casserole Baking Dish with lid. 1 x 2 pt Pint Covered Casserole Baking Dish Casserole with lid. JUNO PATTERN. ROYAL DOULTON. COFFEE POT - TALL. ORIGINAL MADE IN ENGLAND (NOW DISCONTINUED). and if you are searching for any specific item, such as, just a Saucer, Lid, Base, we may be able to help you. Juno by Royal Doulton. May show signs of light wear. JUNO PATTERN. ROYAL DOULTON. COFFEE CUP & SAUCER - CAN SHAPE. and if you are searching for any specific item, such as, just a Saucer, Lid, Base, we may be able to help you. FINE CHINA. ORIGINAL MADE IN ENGLAND (NOW DISCONTINUED). Royal Doulton JUNO Milk Jug. Decorated in a Juno pattern, on a Creamy White background. Bears the Royal Doulton Juno backstamp which is scored, usually denotes 2nd quality but looks just fine. Royal Doulton Juno Large 2 1/2 Pint Teapot - New ! Royal Doulton Juno Teapot - New ! In Unused Perfect Condition. A used bread and butter plate. In great condition. No chips or cracks. A few knife marks on the surface due to use. See all the photos for proof of condition. UK postage only. Use global shipping programme for international postage through ebay. Will be proof of postage and GPO tracked. Postage includes postage and packaging. Backstamp: Royal Doulton Juno C 1988 Royal Doulton Fine China dishwasher safe, microwave safe, chip resistant, freezer safe, oven safe. No cracks or crazing, very few signs of wear. The glazing and colours are very sharp and vibrant. This item is dishwasher, microwave, freezer and oven safe and is chip resistant china. The pattern consists of carnation and iris in peach/pink and blue together with green foliage produced all the way around the pot and lid and placed against a pure white porcelain ground. A used tea cup and saucer. In great condition. No chips or cracks. See all the photos for proof of condition. Cup measures 7cms tall Saucer measures 5cms diameter UK postage only. Use global shipping programme for international postage through ebay. Will be proof of postage and GPO tracked. Postage includes postage and packaging. Free local collection available. These are 1st Quality. The'Buy it now' button has been replaced with 'Add to basket'. New listingRoyal Doulton "Juno" Cup & Saucer ~ Excellent Used Condition. Excellent Condition. Cup Standing 7.2 cm's tall and being 8.4 cm's across the rim. Saucer being 15 cm's across. 4 out of 5 stars - Royal Doulton "Juno" Cup & Saucer ~ Excellent Used Condition. 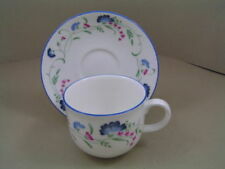 1 product rating1 product ratings - Royal Doulton "Juno" Cup & Saucer ~ Excellent Used Condition. Royal Doulton "Juno" Cup & Saucer ~ Excellent Used Condition. Royal Doulton Juno Trio With An Extra Tea Plate. Great Condition.